Members of the Portuguese Heritage Publications of California, will be on hand during the IFEDS – Irmandade do Divino Espirito Santo (Gilroy) Holy Ghost Festa, on May 4th and 5th. They will answer questions about the recently released book: Power of the Spirit – A Portuguese Journey of Building Faith and Churches in California. 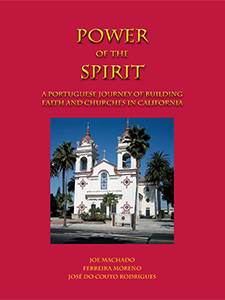 In addition to the history of these 40 churches spread throughout California, the book includes short biographies of over 110 members of the Portuguese-American clergy who guided the spiritual lives of our communities for the last 150 years. This is a book that you will forever be proud to own and gladly share with your family and friends, for it encapsulates 150 years of the history of our forefathers’ “Powerful Spirit” – A wonderful Mother’s Day gift! The book Power of the Spirit – A Portuguese Journey of Building Churches and Faith in California, was introduced to the community of Santa Clara, during Sunday March 3rd. 10:30 am mass, at St. Clare’s church. St. Clare’s church is prominently featured in the book thanks to the excellent research and writing skills of Elizabeth Viano Bettencourt and Joao Arruda, for which we are thankful. Henrique Dinis, representing Portuguese Heritage Publications of California, was on hand to present the book. St. Clare parishioners had opportunity to review the book after mass and many purchased it. The book Power of the Spirit – A Portuguese Journey of Building Churches and Faith in California, was presented to the Portuguese Community of St. Elizabeth Church in Sacramento on Sunday, January 20, 2013 after the 9 am and 10:30 am masses. Thanks to the initiative and teamwork of members of the Portuguese Historical and Cultural Society, led by Marilia Wiget and Dolores Greenslate, Power of the Spirit was introduced to the local community and affectionately received by all. Following the masses, parishioners had the opportunity to purchase the book which was available for sale at the churche’s hall. Henrique Dinis, representing Portuguese Heritage Publications of California, was on hand to present the book and assist with sales. Judging by the number of books sold, the event was a success.